A lovely example of this model in yellow. 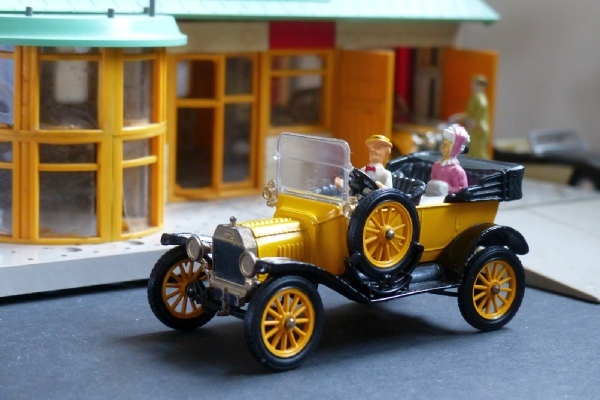 There are two other Model T Fords: 9011 is a black one with two passengers and 9013 is a blue one with a full closed hood and a chap looking as if he is trying to crank it up at the front. This one has the same passengers as 9011. None of these Classics seem to be making much money these days. I can only guess that there were a lot made over a long period of availability and there is no doubt that they were aimed at a different market too, probably older people who were more likely to maintain them in good condition. These are not models that you’d whizz around the carpet so there are going to be proportionately significantly more surviving in good condition, keeping prices low.